Thorn-D® antifouling outperforms conventional antifouling coatings and is environmentally friendly. A pilot project which started one-and-a-half years ago, has proven that this new thin film coating performs better than traditional antifoulings. A real ecological and cost-efficient breakthrough for shipping companies and shipyards. Dutch innovation and award-winning company, Micanti, in co-operation with Damen Shipyards, launched a pilot project in the Port of Amsterdam in February 2013.
coatings. The Castor, a Damen Stan Tug 1907, was treated with a well-known conventional antifouling coating. The Pollux, also a Stan Tug 1907, was treated with the new foil, Thorn-D®. Both vessels operated at low speed in the Port of Amsterdam, under the same conditions and in the same waters. Conventional antifouling coatings need movement to keep marine growth from adhering to the vessel. Thorn-D®, a fibre which acts as a physical barrier, does not require movement, and even works when a ship is moored. “We have measured the speed against its sister vessel Castor (built at Damen at the same time) on delivery. We have seen no differences at all. At present, fuel consumption is still at the level as it was at delivery. On top of this,Thorn-D® is 100% environmentally friendly, essential in reaching sustainability targets,” says Spoelstra. MARIN) as well as in practice on operating vessels. The general conclusion is that Thorn-D® fibres do not increase drag due to a change in the hydrodynamic flow structure. Dutch innovation and award-winning company, Micanti, founded in 2006, develops products for effective non-toxic fouling defence technology. Micanti strives to be the market leader for non-toxic antifouling through a patented technology by applying fibre thorns as a fouling repellent. For years, the patented product Thorn-D has been tested and continuously improved in various environments. Port of Amsterdam manages, operates and develops the port. It ensures a safe, swift and environmentally responsible management of shipping traffic within its working area. The exploitation is aimed at port sites (rental and leasing), quays and water. In the entire Amsterdam port region a yearly amount of over 94 million tonnes of goods are being transshipped. 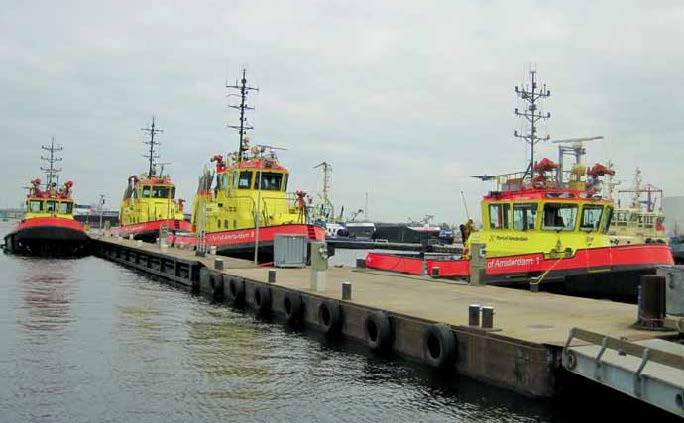 Damen Shipyards Group operates 32 ship- and repair yards, employing 9,000 people worldwide. Damen has delivered more than 5,000 vessels in more than 100 countries and delivers approximately 160 vessels annually to customers worldwide. Based on its unique, standardized ship design concept Damen is able to guarantee consistent quality. Damen’s focus on standardization, modular construction and keeping vessels in stock leads to short delivery times, low ‘total cost of ownership’, high resale value and reliable performance. Furthermore, Damen vessels are based on thorough R&D and proven technology. In addition to ship design and shipbuilding, Damen Shiprepair & Conversion offers a network of 16 repair and conversion yards worldwide, with dry docks ranging up to 420 x 80 metres. Conversion projects range from adapting vessels to meet today’s requirements and regulations to the complete conversion of large offshore structures. DS&C handles 1,500 repair and maintenance jobs annually.